So I am a new owner of a stock FF03 chassis. On my TBLM 8T with a TBLE1 ESC, that is 4750kV on 2s. Nice and fast pretty stable on the track where we drive, not your daily asphalt you are used to. I got the car setup as it is now. I dont have any idea what kind of diff oil should I use here? lets say conditions with medium to high grip... ? Next idea was... I am not a fan of the 3 racing carbon conversion, the blue bling bling can be left out. So making the whole chassis carbon reinforced with the standard turnbuckles and some carbon parts that are available from tamiya, like the rear shock tower... do the black big bore shocks fit on these? like a FF03 black edition I you can imagine what I mean. A stock carbon reinforced chassis with gear differential? part numbers? FF03R Gearbox cases allow you to run the TA06 gear diff, if you can find them. I had that on my other FF03. I didnt upgrade anything else, it never felt it needed it and that was after a lot of laps at a asphalt track. (other than a rear wing). There is a huge FF03 thread on rctech. Loads people had issue with the ball diff. I never did. Sorry missed the middle text, I see you're already on it. The carbon reinforced chassis is stiffer than the stock chassis but not heaps stiffer, anything that stiffens up the chassis/suspension will typically reduce grip on rough surfaces. Typically we stiffen chassis parts on high grip tracks to allow more obvious tuning changes. There is lots of things you can upgrade on the chassis, removing slop from the front suspension seemed like a no brainer for me. I noticed that the tub chassis flexes a bit in its rear part. So i created a stiffener using a 2mm CF board (which I actually copied from the Tamiya 54264). 3Racing also has their own version. I'm working on my slow build with my FF03. Haven't ran it yet as I am still waiting for a few more parts to complete the build I want to achieve. Here's my kit's current state. Some parts may not be necessary to change but I love the bling. The ESC and servo CF trays are also fabricated. While many of the parts installed are mixed of Tamiya & 3Racing. I found my one behaves brilliantly in almost stock form. The only points at which I deviated from the instructions were with the steering rack and suspension bellcranks which I fitted with ballraces instead of the stock bushings, some shims to reduce play in the aforementioned assemblies and some clamping metal wheel hexes. I have also heard of people having problems with the ball diff, but after being built carefully and tightened appropriately, it has given me no issues at all. I try to run my cars only on this green surface. so stiffening the chassis would be a thing to do. so to take out all the slop will help? I thought to order some aluminium spacers from tamiya the 5.5 set. so steering rack and rocker arms are fine carbon reinforced no need to spend on aluminium? I want to keep it light as possible and possible replace the chassis with the carbon reinforced one. Also gear diff, would be a choice to have less maintenance (?? ), and to get more familiar with gear oil diff as most new chassis use those. I am following your build. I think it was exactly your build that lighted my fire for a FF03 again last year. then I have orderd for a friend a FF03 with a skyrc ARES 5.5T mod motor... after he finished building his stock FF03... it was just a question of time. I would like to include the stock motor mount with blue heat sinks. otherwise, carbon reinforced partf, CF rear tower, CF front bumper support, CF servo plate, aluminium servo holders. not sure what shocks should I fit on this car? plus carbon damper support and carbon servo plate, also rocker arms and steering could possible ball raced allready. Get the 3Racing carbon fiber rear shock tower and you will skip this ^^^ part. The damper stay is aluminum and the CF shock tower has many adjustable options. I heard that the Yeah Racing dampers perform and are more durable than the 3Racing. But if budget isn't a problem, then go for TRF dampers. The best there is. Other than that, there are many cheaper hop up parts for this kit from 3Racing and Yeah Racing for about 50% more or less than the cost of original Tamiya parts. Having recently fitted a set to my M-07 I can confirm that the Yeah Racing dampers are very good for the money. Quality of finish is not quite TRF standard but it is very close, and in terms of smoothness I can tell no difference at all between them and TRFs. I have the yeah racing ones on my M03. My friend has the 3racing ones, in my opinion they are more smooth then teah racing. but I would probably go for tamiya shocks... would the big bore m chassis shocks fit? I dont want to use yeah racing or 3racing parts. As the others have suggested the gear diff is the essential mod (using 500k oil in mine). I'm part way through a rebuild, new chassis, ceramic bearings, titanium screw kit and lightweight driveshafts. I think your man math for FDR is a little off (spur divided by pinion multiplied by the IDR ratio). 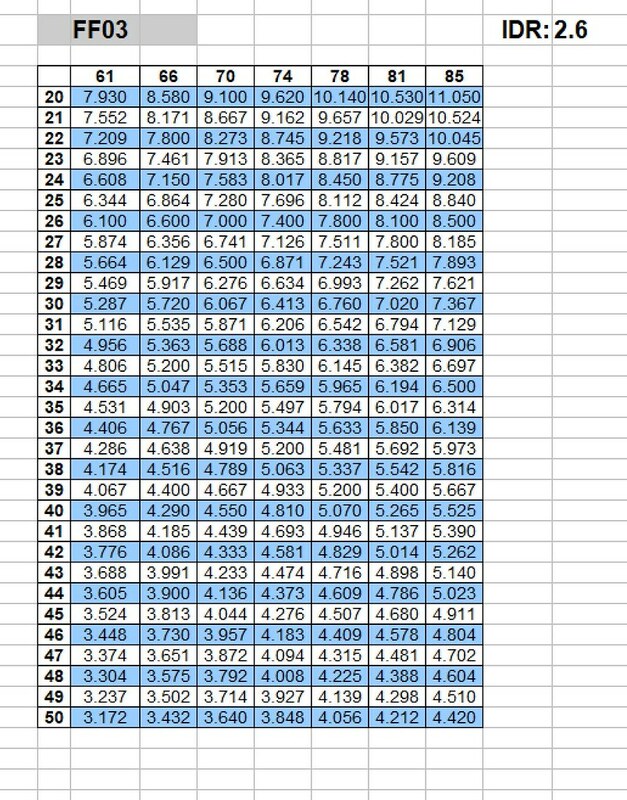 I recently made a calculator for my cars, if you want me to change any of the spur numbers let me know and I will post up another sheet. You are right, I thought the internal is 2.0. About 5.0 is the FDR. good idea with the sheets you have made, does it automatically calculate? here is a small table of parts I would like to have for the FF03. not sure about m chassis dampers, but everywhere they are talking about short dampers, low rear shock towers... is it something to do or should I stick just with a set of 53571? Yes 500,000 and It does auto calculate, I would be happy to post a few more if there are any requests from anyone. You want standard size touring car shocks, I run the black coated TRF (same as Nicadraus) that I later added big bore springs to. I would swap out the Carbon reinforced deck and go for a Steering set 54235 and Carbon link 54261.